I had a dream last night about my Aunty Marilyn. For some reason I didn’t see anyone else in this dream, just Aunty Marilyn, but I knew there were other family members there. We were all helping her pack up the house so she could move. That house on Lunaai Street in Kailua holds a lot of memories. 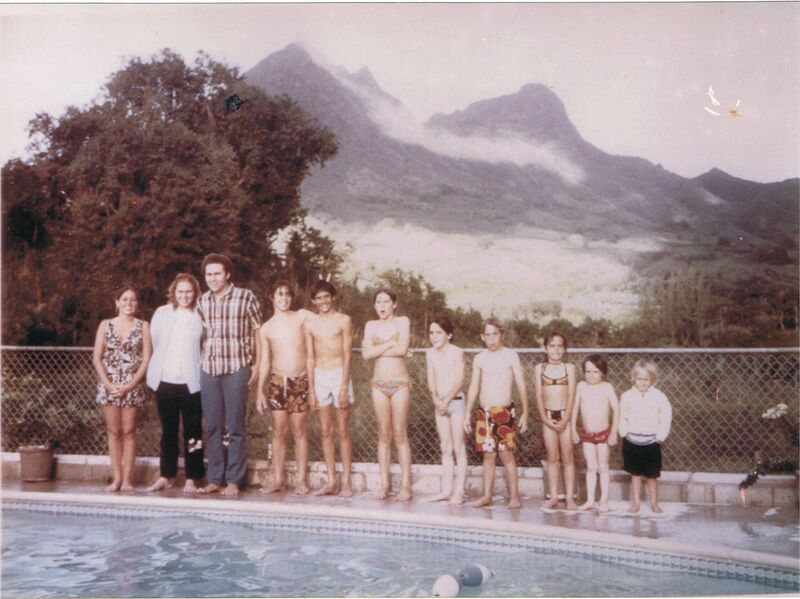 One of my favorite pictures of my brothers and sisters and cousins was taken on the far side of the pool, Mt. Olomana in the background, each of us organized by age. My Uncle Jack took this picture, along with who knows how many thousands of others. We were always saying “Uncle Jack! Not another picture!” Now, of course, each one is precious. Even more so now since Uncle Jack passed away this year. Anyway, I woke up crying. It felt like Aunty Marilyn was moving away from but I didn’t know where to. The feeling of my family getting dim in my mind’s eye, like fading old pictures, made me quite sad. I miss them. All my old aunties, sitting on the back seat of The Bus, dressed up in their muu muus, hats, bandanas and shell purses. They would see me get on the bus, probably leaving Community College, and shout “Stevie! Stevie! E nei!” The many, many family dinners at the house on Lunaai, or at our house on Hui Kelu, or at the beach. Spending time with my dear cousin Laurie and getting the drama bug from her and my sister, Eve. Braving King Intermediate with my dear friend, Peter Jones (who I owe an email–Peter, I didn’t forget). You get the picture. I’m having one of those bittersweet moments. This holiday season (whatever you want to call it) take my advice. Enjoy every moment. Even the ones where someone has a little too much to drink and starts singing “Stormy Weather” with great gusto. Oh, and don’t miss the ones where the two old aunties break out an ukulele and tissue paper and comb and bust into a hilarious rendition of “Meleana E”. This year I’m planning to make new memories but I know the old will be with me always. Mele Kalikimaka! and Hauoli Makahiki Hou! This entry was posted in Thoughts by Steve. Bookmark the permalink. Stevie, this is an awesome site. You had me in tears reading “When I wake up crying.” Drop me an email some time.